You're relaxing on the beach. It's 85 degrees. You're sipping a daiquiri, thinking about joining the conga line when it hits you: I hope my cats are OK! Fortunately, thanks to Skype, it's easier than ever to check in with your pets while you're away. They may not take to it immediately, but learning to use Skype will help distract them from eating your shoes and vomiting on your stuff. Today's cats and dogs live in a fast-paced world of laser pointers, boxes, and squirrels. It's a lot to keep up with, so giving your pets a computer is a must. Also, make sure they have a nice ergonomic setup — for dogs, lumbar support is key. In the case of cats, though, you can put the computer literally anywhere and their boneless bodies will flop into a comfortable position. Your pet may not want to speak while using Skype, instead staring blankly while you ask "Who's a good boy?" over and over again. However, should they wish to bark or meow, or give you that painfully sad look that makes you cave to their every wish and desire, they'll need to know how to use the computer's camera and microphone. It may take several weeks of strenuous training, but try teaching them by placing a trail of treats leading to the computer. If they successfully speak into the mic, reward them with a sweet little scratch behind the ears. The lack of opposable thumbs puts your furbaby at a disadvantage when it comes to downloading apps. Lucky they have you to take care of it for them — download Skype here. 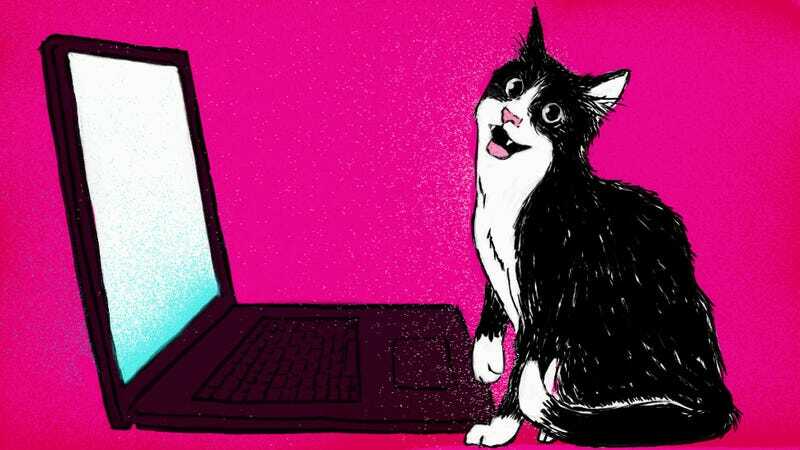 Once you've downloaded Skype, create an account for your pet. You can simply use their name, or, if you wish to fully capture their personalities, feel free to use a username — like JuicyTail99 or LitterQueen — that reflects their personality and interests. You'll also have to create a password. Try one that will be memorable for your pet, perhaps by mashing random keys in the same way your they do when they walk across the keyboard. Finally, add your own Skype account to their list of contacts so they can call you with a mere click of the paw. When your pet first receives a Skype call, they probably won't react at all, since most animals have not yet entered the modern age of digital communication. To get them pumped about using Skype, consider Pavlovian mind tricks such as playing the Skype ringtone before feeding them dinner. Or, better yet, you can customize their ringtone for a sound so compelling they'll even interrupt their naps to answer it. Common ringtones for dogs include the doorbell, a squishy toy, or the mailman's footsteps. For cats try a crinkly plastic bag or the captivating chirp of a bird. If none of these tricks work, set up Skype's auto-answer feature, and configure it to pick up your calls without requiring your pet to fumble with any unwieldy buttons. Congratulations! Your pet is now a fully trained Skype user. Sure, you may feel racked with guilt as you pack your suitcase and notice the doleful look coming from little Princess Purr, but relax — it will all be forgotten a few hours from now when you see that adorable furry face staring out from your Skype window. Who knows what amazing and exciting news they'll have to report! Maybe they caught a mouse or — even more impressive — their own tail. Or perhaps they just took a refreshing 8-hour nap in preparation for an even more refreshing 12-hour nap later. Wherever your conversation takes you, you'll feel like you never left your beloved pet's side. Download Skype now, and breathe easy later. This post is a sponsored collaboration between Skype and Studio@Gawker.